Live the rags to riches story with your Sims while being connected to your friends! Experience the rise to stardom as your Sim performs on stage from one venue to the next. 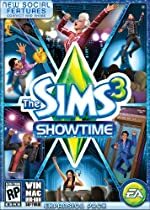 And for the first time, The Sims 3 Showtime introduces social features, including Passport, an all-new feature that lets you send your Sims to a friend’s game! There, your Sim can perform at your friend’s venue in front of your friend’s Sims! You will also be able to chat with friends and post messages and screenshots on your friends’ walls.